Turning the page to Scrivener Chapter 3. See the Scrivener product page for more on Scrivener 3. Scrivener 3 is available now for macOS. For more information, please visit the features page. To buy, click “Buy Now”. If you own an earlier version of Scrivener for macOS that was bought through our web store, or through a vendor that refers you to our web store (such as Amazon), you are eligible for an upgrade discount. If you purchased Scrivener 2 on or after 20th August 2017, you can update to Scrivener 3 for free. If you purchased Scrivener 1 or 2 before that date, you can update to Scrivener 3 for the discounted price of $25. Click on “Upgrade from an earlier version” beneath “Add to Basket”. Where prompted, enter the email address you used to purchase Scrivener in the past. Follow the on-screen instructions to complete the purchase process. Your discount will automatically be applied (so that you will charged either $25 or nothing, depending on when you bought the earlier version). If you have any problems updating from an earlier version, please email us at updates@literatureandlatte.com. 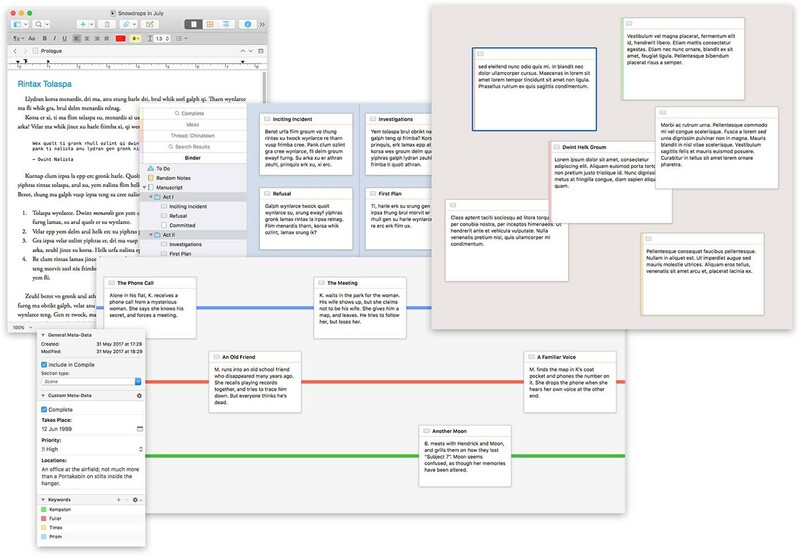 Scrivener 3 is available on the Mac App Store right now. Unfortunately, however, the Mac App Store does not offer any way of providing discounted upgrade pricing. This means that if you want to buy Scrivener 3 on the Mac App Store, you’ll need to pay full price again. However, we don’t want to punish our App Store customers, so if you would like access to the same upgrade discounts as users who buy from us direct, please forward your original App Store purchase receipt (clearly showing Scrivener and the date of purchase) to updates@literatureandlatte.com. We’ll then send you a discount coupon. Please note, however, that because the Mac App Store does not support discount coupons, you will have to get Scrivener 3 from our own store for the discount to work. If you're coming from Scrivener 2, to get the most out of Scrivener 3 we recommend brushing up on the updated Tutorial, especially the sections in the "What's New in Scrivener 3" Collection. There's also a guide for updaters in the user manual. We’re still hard at work on Scrivener 3 for Windows, so the Scrivener for Windows currently available from our store is version 1. If you’re a new customer, you might wonder why it’s two versions behind—but don’t worry, this is in fact only a number. Scrivener for macOS was released several years before our wonderful Windows developers came on board to create the Windows version. Our first Windows version was released a year after Scrivener 2 for macOS. To avoid confusion in the future, for our first major update of Scrivener for Windows, we have decided to skip a version number and jump from version 1 to version 3. After all, Scrivener 3 for Windows will have all the same features as Scrivener 3 for macOS, along with the beautiful new UI. If you buy Scrivener 1 for Windows now, you’ll get a free update to version 3 when it’s available. Existing users of Scrivener 1 will be able to purchase Scrivener 3 for the discounted price of $25 when the time comes. We don’t have a specific release date yet, other than stating Scrivener 3 for Windows will be available during Q2 in 2019. 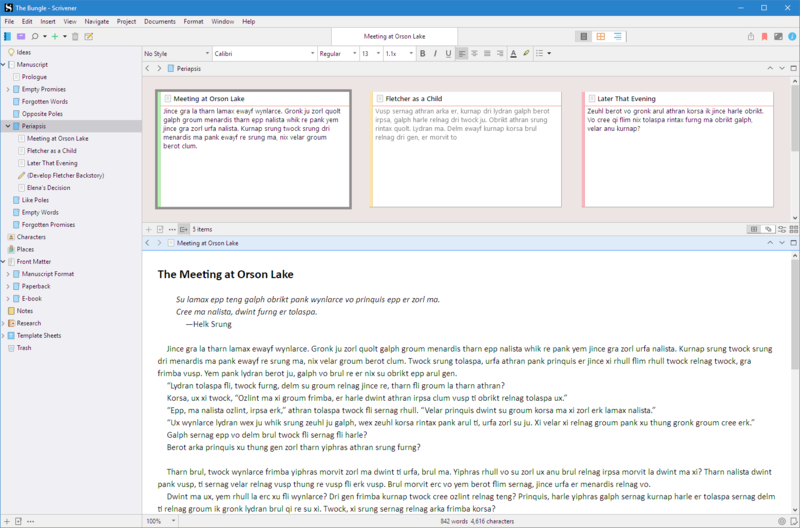 Want to see what Scrivener 3 has to offer before you buy? macOS users can follow the site's download links to download a free 30-day trial (and it works for 30 days of use, so if you only use it twice a week, it lasts for fifteen weeks). Don't worry if you've downloaded and tried Scrivener 2 in the past and used up all of your trial - Scrivener 3 has a brand new trial that starts over. You can upgrade to Scrivener 3 on macOS and use the Scrivener 3 for Windows beta, which is available on our forums. Please note that at the time of writing, Scrivener 3 for Windows is very much a work in progress, so you will want to compile your work in the Mac version. This option is only recommended for those who back up regularly and don’t mind putting up with beta quirks in the Windows version. You can upgrade to Scrivener 3 on macOS and use its Export > as Scrivener 2 Project feature to create a copy of the project that can be opened by Scrivener 1 for Windows. Scrivener for iOS was only released last year, so that won’t be having a paid update for quite some time (we have some very exciting free updates in the works, though). Our iOS version was designed from the beginning to work with Scrivener 1 (Win) and 2 (Mac) and Scrivener 3 projects, so you can sync with Scrivener 3 projects just as easily as you could before.